The much-rumored, much-anticipated and much-debated BlackBerry Priv has been leaked once again, and this time around, it's by BlackBerry itself, on its official website! The supposed 'accidental' leak by the Canadian company has now laid bare the hardware specs, pricing and shipping date of the device in the company's home country of Canada. 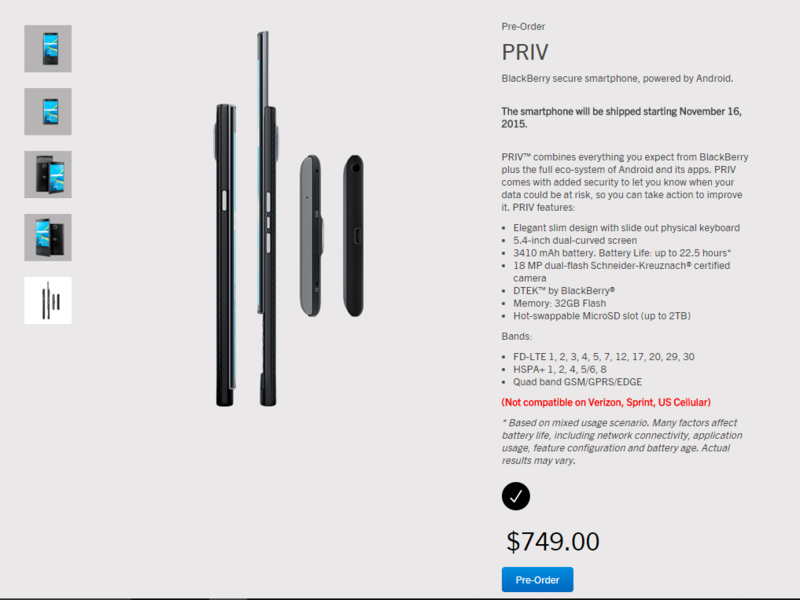 As for the latest leak, reports floating around on the net claim that the Priv was temporarily listed on Blackberry's official website earlier on Thursday, at a price of $949 in Canada. The advertised pricing of course, is for the unlocked, contract-free version of the device, but carriers will obviously sell it at a lower, subsidized price on contracts. Canadian website MobileSyrup claims that one of the largest wireless carriers in the country, Bell, has apparently already revealed that it intends to sell the handset for $799.99 at full retail or $399.99 on a 2-year 'Share Everything' plan. The now-defunct webpage apparently also revealed that the handset will start shipping to its rightful owners November 16th onwards. As for the upcoming smartphone, the device will be the very first Android device of any description from Canadian smartphone maker BlackBerry (formerly Research in Motion), and was originally known by its internal codename BlackBerry Venice. The handset came with the model number STV100-1 on the BlackBerry website for its temporary listing, and is believed to be one of the few Android-based smartphones to come with a physical keyboard. While the listing page has since been removed, news about the latest leak is getting the handset all the attention that BlackBerry would have hoped for, and now the only thing that remains to be seen is if the smartphone actually lives up to all the hype and expectations, and is able to bring BlackBerry back from the brink, once the device is actually available on store shelves across the globe. The phone of course, will be available for pre-orders from Friday as earlier reports have already indicated. The Priv of course, will have a BlackBerry trademark sliding QWERTY keypad, alongside a capacitive touchscreen display, which is more in line with smartphones circa 2015. Taking a quick glance at some of the important hardware specs of the handset, the device will feature a 5.43-inch display with a QHD resolution, and will be powered by the Qualcomm Snapdragon 808. The handset will come with 3 GB of RAM and 32 GB of internal storage, and have a 3,360 mAh non-removable battery. Imaging options on the upcoming Priv will include an 18-megapixel primary camera on the rear and a 2-megapixel front-facing selfie-cam.